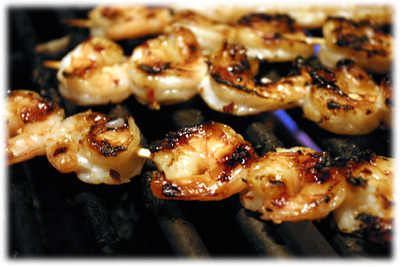 We really had a lot of fun with this grilled shrimp recipe. Judge your audience before cooking shrimp with this recipe, I've seen folks not able to eat them because they're so hot. This recipe is actually pretty easy to prepare and the dry rub was designed especially for grilling with these. Now, if you do like spicy foods then by all means give these a try, many of my friends don't find them too spicy at all (or at least they say they don't). I like them served with grilled steak, adds a nice edge to the meal. For best results let them sit in the rub for 30 minutes before grilling. Soak the skewers in water (or Jack Daniels!) for at least 30 minutes. Thread 5 - 6 shrimp on each bamboo skewer. 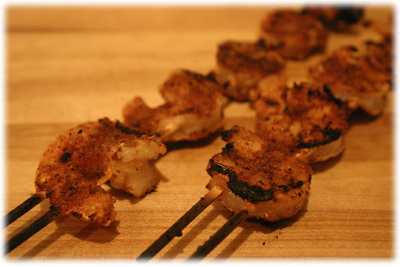 If jumbo shrimp are used, use two parallel skewers when threading them, that way they don't spin on the skewer when turning them over on the grill. 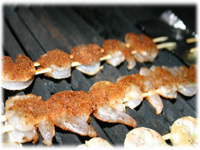 If the shrimp aren't big enough then just use a single skewer when threading them. Rub Firehouse Spicy dry rub over both sides of each kebab. 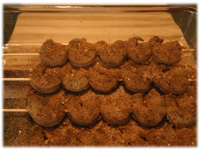 Place them in a 9 X 13 glass dish, cover with plastic wrap and refrigerate for at least 30 minutes. Remove them from the refrigerator, keep covered and allow to come to room temperature. Oil grates of the grill. 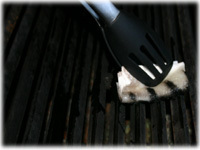 Place the shrimp on the grill and close the grill cover. Check after 3 minutes, they're are beginning to turn pink and showing nice charred grill marks on the bottom then flip the skewers and close the lid. Check again after another 3 - 4 minutes to ensure they appear fully pink and grill side is showing nice browning and slight charring. 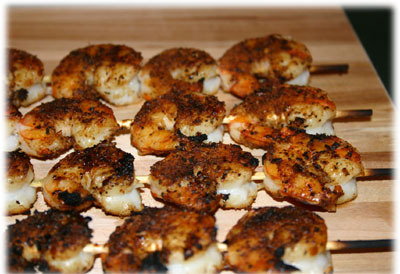 If they look good, remove the grilled shrimp and serve immediately.